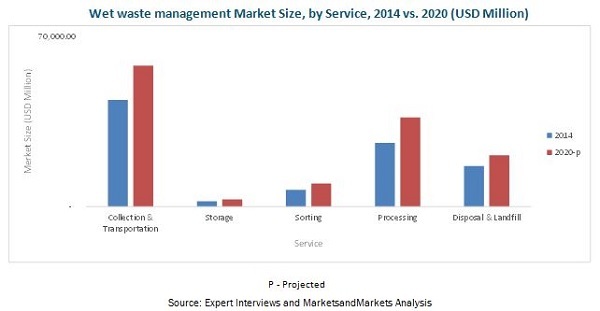 [230 Pages Report] The global wet waste management market witnessed a rapid growth from 2013, and is projected to grow at a CAGR of 5.09% during the forecast period from 2015 to reach USD 128.40 Billion by 2020. Asia-Pacific dominated the market, with a share of ~33% in 2014. This market is driven by an increasing competition, aggressive pricing, rising environmental sustainability, increasing waste regulations & safety, and various developments in the waste management technology. The Asia-Pacific region is estimated to become the fastest-growing market for wet waste management. The wet waste management market in the Asia-Pacific region is projected to grow at the highest CAGR from 2015 to 2020, in terms of volume and value. The rising awareness for wet waste management of the region with upcoming new technologies such as waste-to-energy solutions, the growing usage of eco-friendly material and increasing environment sustainability, and the parent waste management industry are driving the growth of the wet waste management market. Another factor is the densely populated areas of this region that require wet waste management solutions. 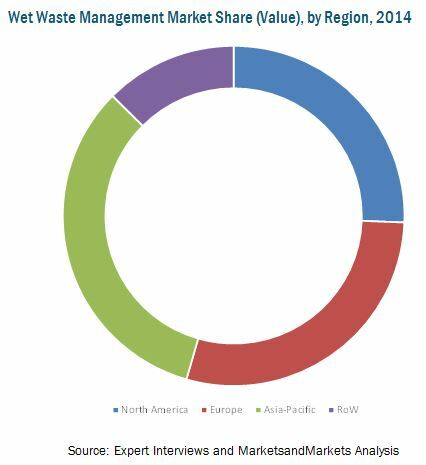 This report estimates the market size of the global wet waste management market in terms of value (USD million). In this report, the market is broadly segmented on the basis of waste management service, waste source, waste type, and region. Market drivers, restraints, challenges, raw material, and product price trends are discussed in detail. The global wet waste management market has grown exponentially in the last few years and this trend is expected to continue. Strict government on environmental and waste regulations, reducing landfill, environmental pollution awareness, waste-to-energy solutions, and growing population make wet waste management an attractive market of the global waste management industry. Wet waste management is observed for multiple sectors such as food & beverages, industrial, pharmaceutical, agriculture, and others. Niche markets in which wet waste management is used are aerospace, nutraceuticals, and textile. The growing demand for wet waste management in developing countries such as Japan, India, the U.K., and Brazil is due to the strict waste and environmental regulations and heavy waste generation. Key factors such as growth in the parent waste management market, increasing concern towards reducing pollution and increasing sustainability and safety, and development in the technology for waste management are contributing to the growth of the wet waste management market. The Wet waste management market is projected to reach USD 128.40 Billion by 2020, at a CAGR of 5.09% during the forecast period from 2015. Waste processing is projected to be the fastest-growing wet waste management service, at a CAGR of ~5.89% during the period under review. Factors such as growing population, with growing waste generation and management services, make wet waste management an attractive market of the global packaging industry. The market for wet waste management in the Asia-Pacific region is projected to grow at the highest CAGR from 2015 to 2020, in terms of volume and value, having accounted for market sizes of 210.6 MT and USD 31.67 Billion, respectively, in 2014. The rising awareness for wet waste management of the region with upcoming new technologies such as waste-to-energy solutions, the growing usage of eco-friendly material and increasing environment sustainability, improved economic conditions, and lifestyle, along with growing waste management industry are some of the reasons to trigger the higher demand for wet waste management market. Europe is projected to be the second-largest region considering wet waste management in the world. The market for wet waste management is driven by the rapid growing industrial waste generation and the need to manage it in the region, growing at a CAGR of more than 4.93% from 2015 to 2020. This market is driven by the growth in the parent waste management industry, along with rising awareness for wet waste management and upcoming new technologies such as waste-to-energy solutions. The rising population generates rapid waste, hence the need of waste management services, along with growing environmental concerns for landfills and waste disposal, increases. Stringent government regulations for waste management and disposal also facilitate the implementation of wet waste management services. The global wet waste management market is characterized by intense competition due to the presence of a large number of big and small firms. Mergers & acquisitions and partnerships & expansions are the key strategies adopted by market players to ensure their growth in this market. Companies such as Waste Management Inc. (U.S.), Republic Services Inc. (U.S.), Veolia Environment S.A. (France), SUEZ Environment Co. SA (France), and Clean Harbors Inc. (U.S.) are some of the prominent companies in the wet waste management market. 2.1.2.1.1 Breakdown of Primaries, By Company Type, Designation, and Region. 12.7 Progressive Waste Solution Ltd.